Furnaces / HVAC Heating and Cooling Sales in Brevard County, Florida - Serving Melbourne, Titusville, Palm Bay and surrounding areas. The 58STA/58STX 4-way multipoise gas furnaces feature Carrier's QuieTechTM noise reduction system for incredibly quiet induced draft operation. Applications are easy with 4-way multipoise design, through-the-furnace downflow venting, 13 different venting options, and a door designed for easy service access. An inner blower door is provided for tighter sealing in sensitive applications. The 58STA furnace is approved for use with either propane or natural gas. The 58STX furnace is approved for use with natural or propane gas, and for use in Low NOx Air Quality Management Districts. 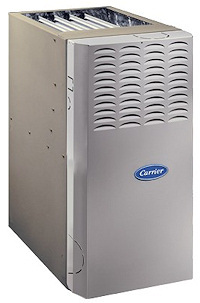 This is Carrier’s base model furnace. It is 80% efficient meaning 80 percent of the heating goes to the house and not out the flue pipe. This is the most popular furnace in rental situations and when a customer wants a quality furnace without spending a lot of money. We installed this furnace into an entire development in the Rockledge, Florida area and the most common compliment was that it is very quiet and self ignites when needed. It is not the most efficient furnace but in the Space Coast area how much do we really call for heat? You won’t find a better furnace for the money. This is only an 80 percent gas furnace but as I mentioned earlier on The Space Coast we only run our heat a few weeks out of the year so the money a higher efficient furnace will run will outweigh the benefits. This Furnace does feature the variable speed blower so you will benefit from the extra humidity it removes in the summer time. Four-way multipoise design for high-efficiency upflow, down-flow or horizontal installations. All models are 39 7/8 inches tall and 28 1/2 inches deep. If you live anywhere North of Florida this is the way to go. 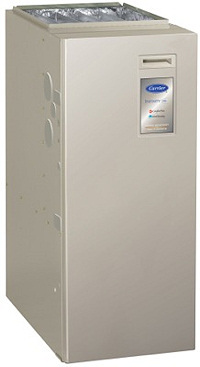 It is the most efficient furnace on the market and the best. It is not very practical to have a 96 percent furnace in the Brevard County area. The costs far outweigh the savings. I have a customer that lives in Titusville and he spent a lot of money on the furnace and to retro fit the flue to bring it to code. He could have saved thousands of dollars on a similar 80 percent furnace. When you only run the furnace a total of one week per year this is not a practical solution. Spend the extra money on a two speed condensing unit. So if you live in Melbourne, Rockledge or Titusville area it is in my opinion to go with an 80 percent variable speed gas furnace.